Mother Octopus is the bald-headed musical stepchild of violinist-composer Dana Lyn (http://danalynmusic.com). Joining her in this project are guitarist Ty Citerman, cellist Clara Kennedy, clarinetist Mike McGinnis and drummer Vinnie Sperrazza. 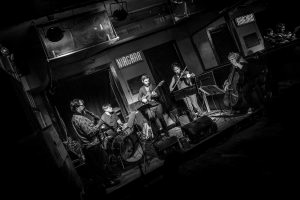 Together since 2011, the group’s collective musical versatility enables Lyn’s compositions to flow with the easy give-and-take of a chamber group as well as allowing it to pulse with the energy of a rock band. Fast-moving, angular lines contrasted with pensive thematic material and free improvisation, Mother Octopus takes its listeners on a journey through alternating musical structures of chaos and uneasy tranquility. Currently, the group is working on its second album, a suite of music inspired by the life and work of Beat Era visual artist Jay DeFeo. This entry was posted by melissa. Bookmark the permalink.